The FOA and NECA (National Electrical Contractors Association) in 2001 cooperated to develop the first ANSI standard (American National Standard) covering the installation of fiber optic cable plants. 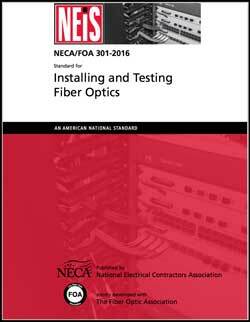 The NECA/FOA-301 standard is unique in the standards world as it was written by contractors and installers for contractors and installers to provide guidelines on how fiber optics should be installed properly. This standard was written to clarify the meaning of the National Electrical Code (NEC) that calls for the installation of equipment in a "neat and workmanlike" manner. The standard covers the installation and testing of the fiber optic cable plant and is intended to be complementary to other appropriate component and testing standards such as those written by TIA and ISO/IEC. NECA/FOA-301 has been kept up to date with the latest revision in 2016. NECA/FOA-301is not just for US users. The standard covers basic practices used worldwide and is an excellent document to use for creating the proper project documents such as a statement of work (SOW), request for proposal (RFP) or request for quote (RFQ) on any fiber optic project. NECA/FOA-301 is part of the NECA NEIS (National Electrical Installation Standards) series that includes not only standards appropriate to electrical installations but also the installation of pathways and spaces and low-voltage cabling, in many cases the installation of components not covered by the usual cabling standards. More information on the NECA-NEIS standards can be found at http://www.neca-neis.org/. The NECA/FOA-301 standard is available free courtesy of FOA (download a copy here, PDF, 1.3MB). Downloading a copy is for individual use by an individual and is not to be distributed further. You may inform others to come to this web page and download their own copy. NECA holds copyright for all National Electrical Installation Standards (NEIS). Reproduction of these standards either in hard copy or soft copy(including posting to the web) is prohibited without copyright permission - see directions here. Printed copies may be purchased from the NECA-NEIS website. NECA holds copyright for all National Electrical Installation Standards (NEIS). Reproduction of these standards either in hard copy or soft copy (including posting to the web) is prohibited without copyright permission.